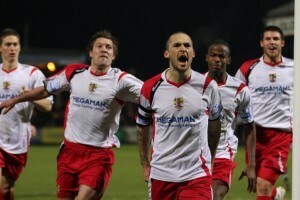 In May 2012, two long time supporters of the club finally decided to take on the daunting proposition of building, maintaining and growing a website that would document the vibrant history of Stevenage FC in words and pictures, after years of talking about the possibility. One of the key decisions made in May was to include ex-player interviews at the centre of what we were trying to achieve. At that point, it was very unclear how easy it would be to track down and get agreement from players to undertake an interview with a website which at that stage simply didn’t exist bar in the heads of the two founders. 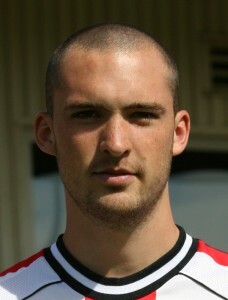 In late June, discussions opened up with a number of ex-players, Mitchell Cole being one of them. Mitch from the first approach was very enthusiastic and supportive of the venture and quickly agreed to be a guinea pig for the site. By late August, following numerous interactions with Mitch, the website had gleaned some great quotes and insights into his career and with his knowledge put this information on the backburner to concentrate on building the site and to gathering base historical information to enable a credible launch. In late October, the site was launched and a rough release schedule indicated the interview with Mitch would be written up towards the end of the year. The sudden passing of Mitch on December 1st was a shock and deeply saddened everyone. It was with great sadness that the history site didn’t manage to write up the interview before his untimely passing or to personally thank Mitch for taking a leap of faith, in taking the time to talk to a still to be created website. In tribute to Mitch, the website has now completed the interview and with the full knowledge and permission of his family, the interview as originally intended now will grace the pages of the history website. Thank-you Mitch. 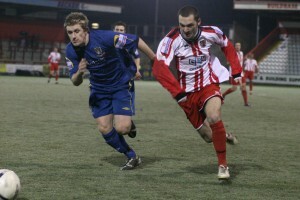 After being released by the Hammers, Mitch was immediately picked up by then Conference South outfit Grays Athletic – spending the 2004/2005 season at the Essex club. Mitch had a successful season playing under Mark Stimson (Stimmo) helping Grays achieve promotion from the Conference South to the Conference National, appearing 35 times and scoring 5 goals in the process. He also picked up his first FA Trophy winning medal at Villa Park as Grays Athletic beat Hucknall Town on penalties. Mitch’s impact at Grays didn’t go unnoticed by near neighbours Southend United, who signed Mitch in the 2005/2006 pre-season. Mitch featured 31 times in his first season scoring just the one goal against fellow Essex outfit Colchester United as Southend were promoted to the Championship. If the first season was to prove a success, the 2006/2007 season in the Championship was a huge disappointment for Mitch with him only appearing a couple of times before eventually going on loan to Northampton Town, appearing 8 times for the Cobblers and netting once. 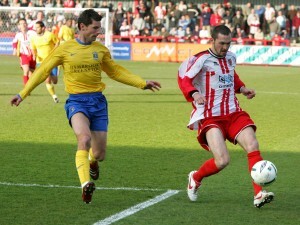 Mitch made the decision to move from Roots Hall and ultimately to drop down again to Conference level with Stevenage Borough – completing his move to Broadhall Way in January 2007. 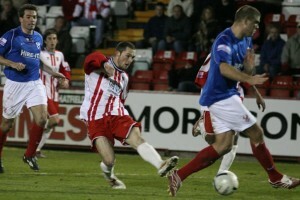 His first goal came in a thrilling 4-4 draw against Forest Green Rovers at the Lawn in April 2007. 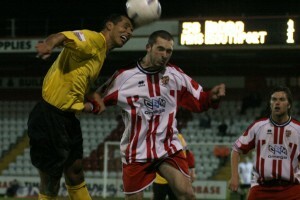 He made his debut in a 1-1 draw with Ebbsfleet United a few months earlier in late January. Boro of course completed a fantastic comeback, winning the Trophy 3-2 in front of a crowd of 53,262 people. Boro had 3 managers whilst Mitch was at Boro – Mark Stimson, Peter Taylor and Graham Westley. Talking about his wider career, unsurprisingly Mitch picks another memorable game from his early playing days. “West Ham when I was at Oxford in the Carling Cup – It really is a different world the higher you go up the Leagues” The U’s lost the game 1-0 at Upton Park in the 2010/2011 season. When asked how he would like his playing days at Broadhall Way to be remembered, Mitch said “I’d like to be remembered as a very quick and skilful player with an eye for goal!” We are sure that no Boro supporter would disagree with his assessment. Mitch also enjoyed success at international level. 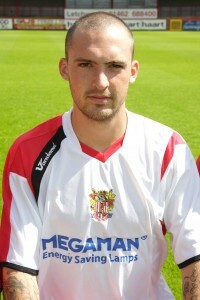 Upon his initial call-up from Paul Fairclough to the England C squad at the age of 17, Mitch first represented his country in the Four Nations tournament in 2007. He very quickly made an impact, scoring a hat-trick in the opening game against a Republic of Ireland XI (a game with England went on to win 5-0). At the time of writing, Mitch is the last player to have scored a hat-trick for the C side. Mitch also went on to bag a further goal against Wales, finishing as the tournament’s top scorer with 4 goals and lifting the Four Nations silverware. 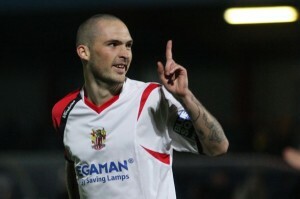 Mitch’s international goal scoring run continued with goals against Finland C, Wales XI and Gibraltar. His seven goals for England C make him the second top scorer for the side. 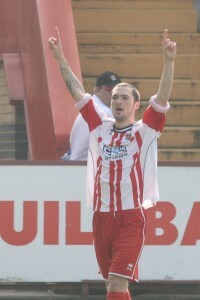 Mitch’s Boro career came to an end with a move to Oxford united completed in the summer of 2010. Superstitions “Nope I never had any superstitions, I just prepared properly before hand with nutrition and hydration and then hopefully let my ability take care of the rest”. In February 2011, Oxford United confirmed that Mitch was to retire from professional football due to a pre-existing heart condition. It was a promising professional career that was sadly and prematurely halted with the player aged just 25. Mitch appeared in Oxford colours just 4 times. Mitch went on to appear for Stotfold (2 appearances), Hitchin Town (11 appearances), Biggleswade Town (6 appearances) and Arlesey Town (10 appearances), still managing to find the net 3 times during this period. On 17th March 2012 the shocking scenes at White Hart lane surrounding Fabrice Muamba’s cardiac arrest finally convinced Mitch that he should “hang up his boots.” At the time, Mitch appeared on a number of television discussions surrounding heart defects in the young generally and sportsmen specifically – and he gave numerous press interviews to raise awareness of his own and other allied heart conditions. “It’s such a sad, tragic loss of a young life. 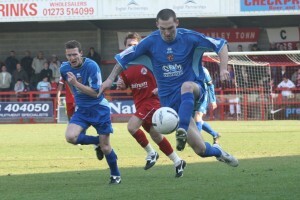 Mitch was a key figure for us in the seasons that saw us enjoy a lot of success.” said Wallace. On a personal note whilst compiling this interview, I was told that I would need to undergo two routine but invasive heart procedures. I was very worried and being a coward found it hard to come to terms with the fear that I was feeling. I mentioned it to Mitch as I thought he would understand. This in my mind is the true mark of the man, he made time for me – I cannot claim to have been his friend, just a long time Boro supporter that happened to get to know him and him me a little better for a brief time – A top man, who I will never forget because of his time playing for the team I love and the compassion he showed me when I was at my lowest ebb – cheers Mitch.